We share with you a Press Release from our partners at ACOOC (Collective Action for Conscientious Objectors), and organization FOR Peace Presence accompanies. 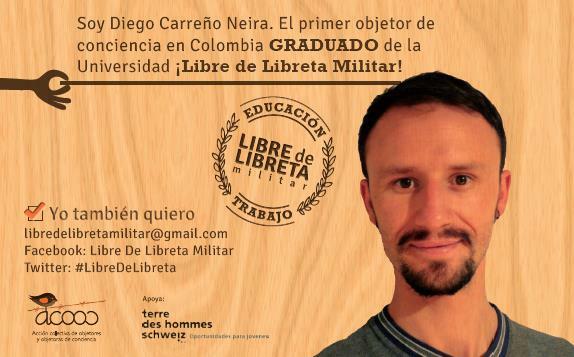 Today, February 27, 2015, Diego Carreño Neira will become the first conscientious objector in Colombia who can openly graduate from college without the libreta militar, or military identification (ID) card. Diego has been part of this movement for 14 years and is currently part of the Collective Action for Conscientious Objectors (ACOOC). In 2003 he declared himself a conscientious objector to the compulsory military service and to being part of the Armed Forces. In accordance with his anti-militarist principles based on nonviolence as a political stance, he refused to pay the compensatory military fee that would have granted him a military ID card. He knew that one of the consequences of his decision would be that he could not graduate from the Universidad Libre de Colombia, where he had begun studying philosophy in 2002. He finished his academic commitments in 2010 then began a legal and political struggle to obtain his degree. On several occasions, both military and judicial authorities denied him his right. For over 10 years the organizational processes of conscientious objectors have denounced the issues facing young people who do not have the military ID card. Among them are restrictions on fundamental rights such as rights to education and work, as well as illegal recruitments, popularly known as “batidas,” which are in actuality arbitrary arrests (Judgment C-879 of 2011 and T-455 OF 2014). It is for this reason that in 2014, ACOOC launched the campaign “Trabajo y Educación — Libre de Libreta Militar” (“Labor and Education — Free of the Military ID Card”), which seeks to eliminate this absurd requirement. With this campaign we hope to discourage the involvement of young people entering the compulsory military service requirement with the purpose of obtaining a military identification card so they can graduate from college or work. After all of these years of struggle, Diego will finally be able to graduate thanks to Article 2 of Law 1738, 2014 – a Public Order Act which enshrines that: “(…) No institution of higher education can require that one must present a military ID card as a condition to gaining an undergraduate degree. ” This particular article was promoted by House Representative Angélica Lozano from the Alianza Verde Colombian political party, and constitutes a fundamental change for many young people in Colombia who have found themselves in a similar situation to that of Diego. That the military card is no longer required to obtain a professional degree is certainly a historic achievement; however, there is still the difficult task of ensuring that this document not be required to work, nor to exercise any fundamental right. This is why we invite you to join the campaign and the organizational processes promoting the demilitarization of life and territories. If the requirement of the military ID card comes before the rights to education and to work, something is backwards. We write nonviolence as a single word to note that it refers not only to the practice of refraining from violence, but to acting according to nonviolent principles as a political and ethical stance of action, participation, and transformation.